An old house and barn look exposed as they sit out in the middle of a field under a gathering of dramatic clouds in the Okanagan region of British Columbia, Canada. 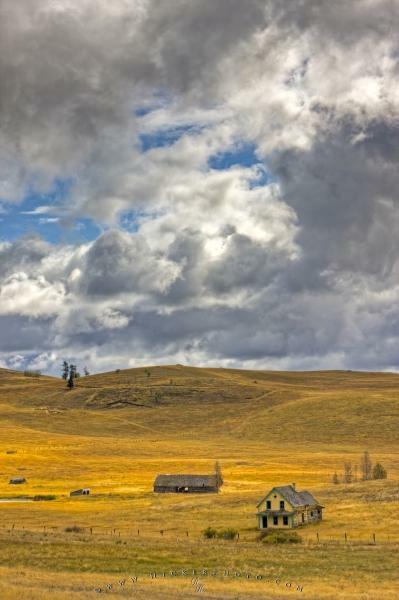 A golden field along the Crowsnest Highway shows some farming history with an old barn and farm house, long abandoned and exposed to the dramatic, threatening clouds above. Old house and barn along Highway 3 (Crowsnest Highway), Okanagan, British Columbia, Canada. Photo of a sky full of dramatic looking clouds and an old barn and house in a field in the Okanagan.